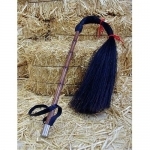 Horse Hair Fly Whisk with Rattan Handle to Help your horse reach the flies that land out of the reach of his tail. Beats using a twig with leaves! What a luxury to own this beautiful fly whisk. Fringe trim provides additional swatting reach, 2" wide hook & loop fastener easily inserts through braid. Handmade in England! What a luxury to own this beautiful fly whisk (your horse will enjoy it to). Handmade in England for the best in quality. Has a leather handle with loop, wooden shaft and braided horsehair whisk.